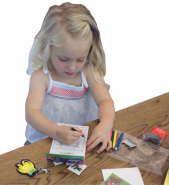 Fun-packed kids activity packs to add value to your child-friendly business. Sell them in your venue for less than the price of two lattes...kids stay busy for hours which means that parents stay and spend for longer too! 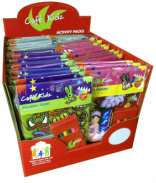 What are Café Kidz Activity Packs? Original and engaging multi-part activity packs for children, ideal for cafes, pubs, restaurants, travel, events and any outlet where parents wish to keep kids entertained in a traditional and fun way. Designed to keep children busy for up to 1 hour, the educational packs are created to appeal to ages 3 to 9 and include a range of themed designs to appeal to boys and girls. 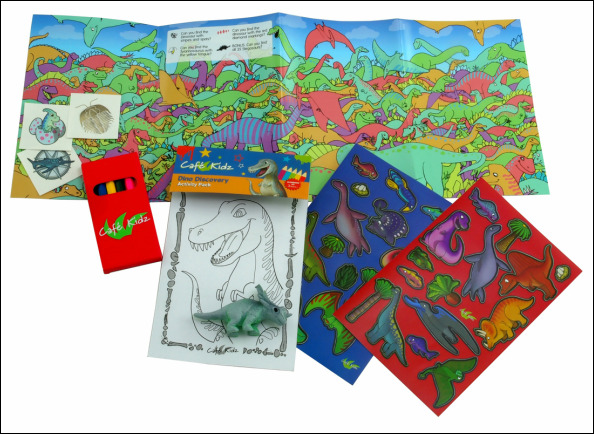 All packs contain a toy, sticker sheets, sticker scene, colouring sheets, games, tattoos and coloured pencils. Pack themes include fairies, monsters, robots, mermaids, animals, dinosaurs, aliens, princesses, pirates and more. All packs are carefully designed and tested by a children's educator to ensure maximum engagement for all children. Contact Us to learn how Cafe Kidz can help your business today. 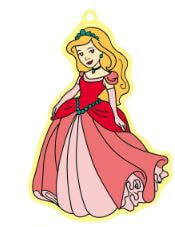 Princess Party and Fairy Fantasy have just arrived! Gorgeous girl packs along with Dino Discovery and Awesome Animals. Yes the wonderful Mermaid Magic packs are back. A fabulous deep sea-sticker-scape to create and all those activities. Collect all those beautiful mermaid keyrings. At last we have the wonderful Pirate Party back again with 6 different key tags to collect, and mystery island sticker mapto create and try and find those missing pirates with your friends. Yahoo the Dinosaur Discovery has arrived. Eight stretchy dinos to collect. Fascinating facts to discover. Make your own sticker dinosaur park. Cafe Kidz UK wins top business award! 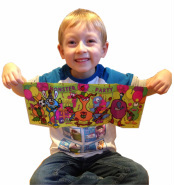 We have now completed the designs of a fabulous dinotastic activity pack. We can't wait to start sending them out! Our Jurassic friends will be landing on these shores very soon. Beware...!